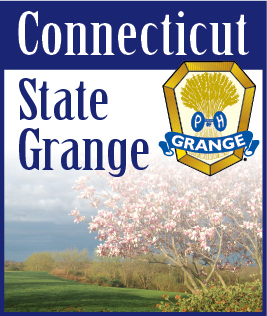 When I started as your State Master the Board of Directors identified values for the Connecticut State Grange, a list that consisted of HONESTY, COMMUNITY, CHARITY, INTEGRITY, FRIENDSHIP, and CITIZENSHIP. These values are the goals that make our Grangers the best that we have to offer. Many hours are given by our Grangers to the community and strangers that need assistance. These values are our selling point as we encourage people to join the Grange. We have survived 150 years and have not lowered our standards in becoming a Granger. I tell people if they wish to live a long life, join the Grange because many of our members are receiving 50, 60, 70 year service awards. The other factor in joining the Grange is that our members know the history of our communities. We know the gossip and where the dirt is. It is a great asset that our members have the knowledge of our towns. The National Grange is reporting that the litigation in California of California State Grange verses the California Guild has been decided. The Guild has been found guilty of taking Grange funds and receiving dues from Community Granges. Damages are to be paid by the Guild to the California State Grange, treble (three fold). Some other items have been filed by the Guild but it seems to be a moot point. Many Community Granges have returned to the California State Grange and we welcome them back to the fold. State Session will be here in October. This is Election of Officers so please have a delegate(s) present to cast your ballot. I thank Amanda Brozana Rios for being our National Representative this year. I think that you will find her energetic and has that Grange Spirit we all need. It has been a great ride for Marcia and myself as your State Master and hope to see the State Grange traveling toward the light of the future. This year Farm Aid will be coming to Hartford on September 22, 2018. National Grange will be working with us with a hands on promotional booth at the event. They had a similar booth at the last Farm Aid concert. We will be looking for assistance in filling the staff at this event. At the Big E, National Grange has teamed up with a group to promote awareness of the Opiate Crisis that has taken over our communities. They will have a booth in the New England Grange Building with information and items to dispose of Rx safely. This is a crisis that we need to win. In just one day New Haven had 91 K2 drug related overdoses at the New Haven Green. Someone was giving away free tainted drugs to get people hooked on it, overtaxing the EMS, fire and police systems. We need to get this under control and provide funding to help these people get off this stuff and crack down on the loose regulations for prescribing these drugs. Greed has again shown its ugly head bringing down people across this country we all love. The mid-term elections are upon us. This year is getting crazier and crazier. Let’s all take a deep breath and use common sense as to who you should vote for. Let us not rely on any information as gospel truth. Just because it’s on the internet doesn’t mean that it is true. Do your homework and fact check everything that is said. I had a boss that always said, “Figures can’t lie, but liars can always figure.” This is the truth that you need to do your own work in giving your vote away. Just remember that we are the people that they have to represent. The Central Office is filling up with Grange furniture from closed Grange halls. If you need newer items, check it out. We have stations, staves, newer song books, chairs, baskets. We need to liquidate these items. Take a look. Fair season is here again. Please go out and visit a Grange Fair and share time with family and friends. See you in October.